A2 Hosting started their journey in 2003. From the beginning, they were always very serious about serving their customers the best way. As a result, they are now one of the most popular web hosting providers in the world. They have a lot of different hosting services for webmasters such as shared, VPS, dedicated and reseller hosting service. However, today’s post is all about the Reseller web hosting of A2 Hosting. If you are thinking about getting this particular web hosting package then you are at the right place. On top of reviewing the Reseller web hosting service, we are about to share certain data about the performance and stability of A2 Hosting. So, you can decide for yourself whether A2 hosting is good for you or not. Reseller hosting service has been on the web hosting business for a long time. However, if you are not familiar with this concept, let’s get to know more about it. Reseller web hosting service is a unique service where you will buy a hosting plan, and then you can share it or even sell it to other people. 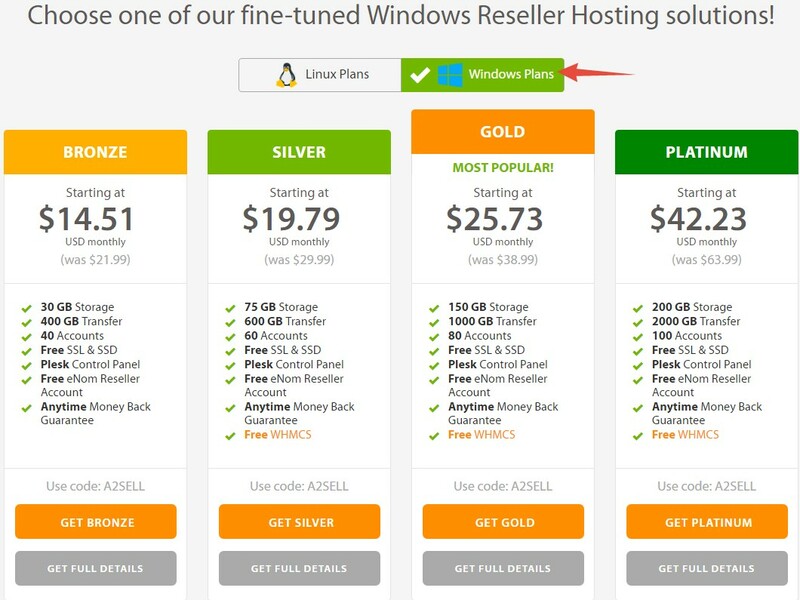 So first, you will buy any one of the reseller hosting plans of your choice. So, you will be allocated with specific space storage, data transfer limitations, CPU, RAM etc. depending on your plan. Now, you can create new plans by splitting up the plan you just bought. And, later you can start selling those plans to your customers. So they will pay you and you will pay the main hosting provider. That’s one thing. Another thing is that you don’t need to start a business if you want to use reseller hosting plans. Anyone can use reseller hosting services. We will delve into more details about this later. We hope you understand the concept of the reseller hosting service now. When it comes to the Reseller Hosting plans of A2 Hosting, they have kept it real simple. So that you can find the plan which you are searching for with ease. Primarily, they offer Linux and Windows OS based plans. Both of these plans have 4 different packages named as Bronze, Silver, Gold, and Platinum. However, the Windows OS based plans are a bit pricier than the Linux OS based plans. We will go into greater details about all these later in this article. This is the cheapest of all the Reseller plans. You can get this plan starting at only 13.19$ per month. Along with this plan, you will be getting 30 GB Storage, 400 GB Transfer, 40 Accounts etc. If these features can’t fulfill your requirements then you should look at the other plans below. As this is the most basic reseller plan. This plan doesn’t come with free WHMCS. This plan starts at 18.47$ per month. You will get 75 GB Storage space, 600 GB Transfer and many more features. You will get only 60 accounts with this package. So, if you need more than that then you can skip this plan. You will also get free WHMCS with this plan. If you are looking for a great deal then the ‘Gold’ plan is the best for you. It is their most popular reseller hosting plan. It is affordable but in return, you will get a lot of features. For instance, for 24.41$ a month, you will be getting 150 GB of Storage space, 1000 GB Transfer, and 80 Accounts. And, as always, the free WHMCS feature is included with this feature. If you have a lot of customers to serve then you will like the Platinum package. You will have to pay 40.91$ per month for this package. And, you will get 200 GB Storage, 2000 GB transfer and 100 accounts. With all these packages you will be getting a lot of features for free as well. For example, you will be getting free SSD and SSL, free WHM Control Panel (not included with the Bronze package), eNom Reseller account etc. We will go into greater details about the features in the ‘Features’ section later in this post. Now, as you already know that A2 hosting also has Windows OS based plans, we will be exploring those in this section. This plan starts at 14.51$ per month. You can use this plan if you are just starting your online journey. You will have 30 GB storage, 400 GB Transfer, 40 accounts. The Silver package starts at 19.79$/month. You will be getting 75 GB Storage Space, 600 GB Transfer, 60 Accounts. If you don’t want to waver from a package to another, then you should get this package. It is their most popular Windows OS based reseller plan. It will cost you 25.73$ per month. And, you will have 150 GB storage space, 1000 GB Transfer, 80 Accounts. If you don’t have any budget-associated problem and want the best package then the Platinum package is there for you. It costs 42.23$ per month. In return, you will have 200 GB Storage, 2000 GB Transfer and 100 accounts. Along with all these, you will be getting free Plesk control panel, Free WHMCS (not included with the Bronze package), free eNom Reseller Account etc. We will cover the additional features later in this post. 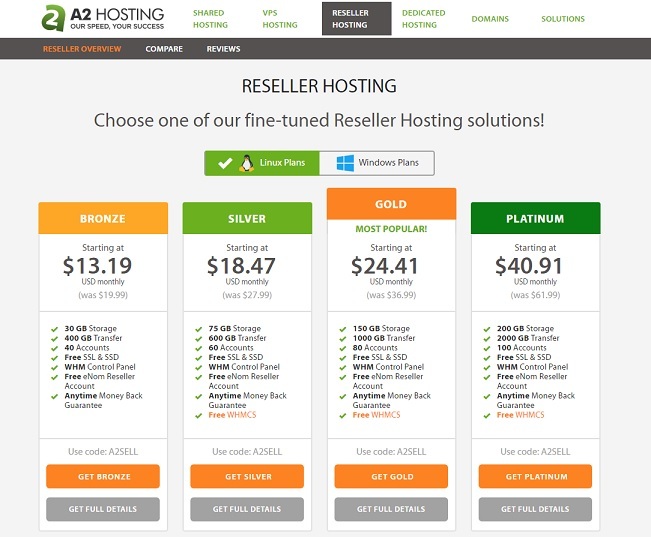 Who should choose the A2 Hosting Reseller Hosting Plan? The reseller hosting service was created to help out the people who want to get into the web hosting business. This is not a general web hosting plan. So, if you have some small websites or own a personal blog then you should not use this service. Although it is true that anyone can use the Reseller Hosting Plans of A2 Hosting as there are no restrictions on it. As you know, if you are thinking about starting a web hosting business then you have to do a lot of different tasks in order to start your business. And, we know that how hard that can be. To make this easier, web hosting companies like A2 Hosting crafted a solution. They have done all the hard works like setting up the servers/data centers, setting up the necessary hardware and software on behalf of you already. So, now you can use their service to kick-start your business. You just need to buy any of the Reseller plans from them and then you can resell those plans to your customers. You can set the new price of those plans, everything is customizable. So, you can make revenue with ease. If you are a non-techy but want to start the business, you can use this plan. As everything server-sided will be taken care of by the A2 Hosting Guru Crew Support Team. So, you can focus on your business instead. If you are an entrepreneur and have multiple websites, you can use this service too. By doing this you can actually save money. As the good alternative plans (Dedicated and VPS hosting) are costly. And if you are a web developer or designer who wants to offer a website as add-on service to your clients you can use this service. Many of the web designers do this so that they can serve their clients as well as save a lot of money in the process. Even if you don’t fall into any of these mentioned categories don’t worry. If you like the service, you can use this without any issue. Generally, people use CMS (Content Management System) of many kinds in their websites. You know that there are a huge number of web applications are out there. It is true that among them some of them are very popular like WordPress, Joomla, Drupal etc. However, not everyone uses these popular ones. So, when you are getting a reseller account you need to check first that if your hosting provider supports most of the web applications or not. Otherwise, you will be in trouble. Let’s say you are running a web hosting business by buying and reselling reseller accounts. And, your hosting provider does not support all the popular CMSes. In this case, your customers will not be able to use their favorite CMSs comfortably on their websites if they use your hosting service. So it is wise to look before you leap. Fortunately, A2 Hosting knows this very well and they are prepared for this inside out. They are compatible with most of the CMSs. And, for the popular CMSs like WordPress, Joomla, Drupal they have special support and tools. So, you or your customers won’t have any problems using any CMS on their servers. You will also have all the necessary software and plugins with each CMS. You will be able to use them right from the cPanel. And, the Autoupdater feature is also included. So, you will not have to update a CMS manually if any new update comes. Rather, it will be automatically updated. All around, we can say that you won’t be unhappy when you get A2 Hosting reseller service as they are optimized for all the popular CMS and web applications. A2 hosting offers some incredible services. For your ease, we will be talking about some of them down below. A2 hosting try their best to provide their customers with ultra-fast servers. So, that all of their customers have the fastest websites. First of all, they are offering SSD (Solid State Drive) on their servers to store the data of their customers’ sites. Using SSD instead of HDD can make your website load faster up to 20 times. And, if you want more power and speed, they offer their ‘High-Speed Swift Server’ feature which can increase the overall speed of your website by 20 times. Although you have to pay for this service. You will have to pay an additional 6.60$ per month for this feature. With this feature, you will have their famous ‘Turbo Boots+ Turbo Cache’ feature too. 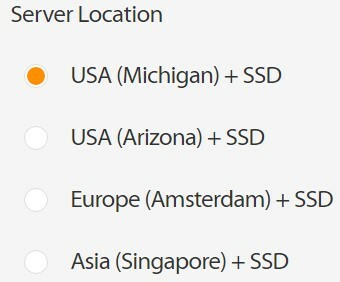 A2 Hosting has 4 servers situated on USA-Michigan, USA-Arizona, Europe-Amsterdam, and Asia-Singapore. When you are getting the reseller hosting account, you can choose your desired server to host your websites. This is a very helpful service. As you should know that if your website is hosted on a server closer to the majority of your site visitors then they will experience high page load speed. So, depending on the location of most of your visitors you can choose the best server for you. Thousands of sites are getting hacked on a daily basis. If you do not choose a web hosting provider which has high-level security then you are in danger. Thus, A2 Hosting has taken some major steps to keep their users’ websites safe. With any of their reseller packages, you will be getting security features like Virus scanning, Server Hardening, Brute Force Defense, Dual Web Hosting Firewall, KernelCare etc. That’s not all. On top of all these, A2 Hosting keeps monitoring the servers manually 24/7/365. So, they can squash any security threats even before they start to develop. And, you will get free SSL certificate with each of your websites. This is a very important criterion for security nowadays. If your website does not have SSL certificate then Google will identify your site as a non-secure website. Normally, you would have to buy the SSL certificate but A2 Hosting gives it for free. A2 Hosting has a backup system in place which they refer to as the ‘Server Rewind’ feature. With the help of this feature, A2 Hosting takes automatic backup of all of their customer’s website regularly. And this is for free. If you don’t like their service, you can cancel your account anytime. And, you will get your money back. If you cancel the account within the first 30 days, then you will get a full refund. Yet, if you want to cancel the account after the first 30 days, you will get back your money for the unused period. Although you are getting WHMCS for free (except for the Bronze plan). Nonetheless, if the free version is not enough for you, you can buy an additional license too. There are several packages named as WHMCS Plus, WHMCS Professional, and WHMCS Business etc. to buy from. A CDN (Content Network Delivery) can increase the performance of your website dramatically. There are a lot of CDN services out there. Among them, Cloudflare is a popular one and it is free to use. You will be able to use any of favorite CDN with A2 Hosting. But, from the beginning, you will have the Cloudflare CDN already added to your account for free. A2 hosting also comes with some awe-inspiring features. You will be able to enjoy all of those with any of the reseller plans. Let’s explore some of them. Your reseller web hosting account will be white-labeled. It means that the cPanel which will be provided with your web hosting service will be non-branded. So, you can customize it your way and make it your own. Thus, your customers won’t be able to know that you are using the service of A2 Hosting. This is a handy feature, to be honest. 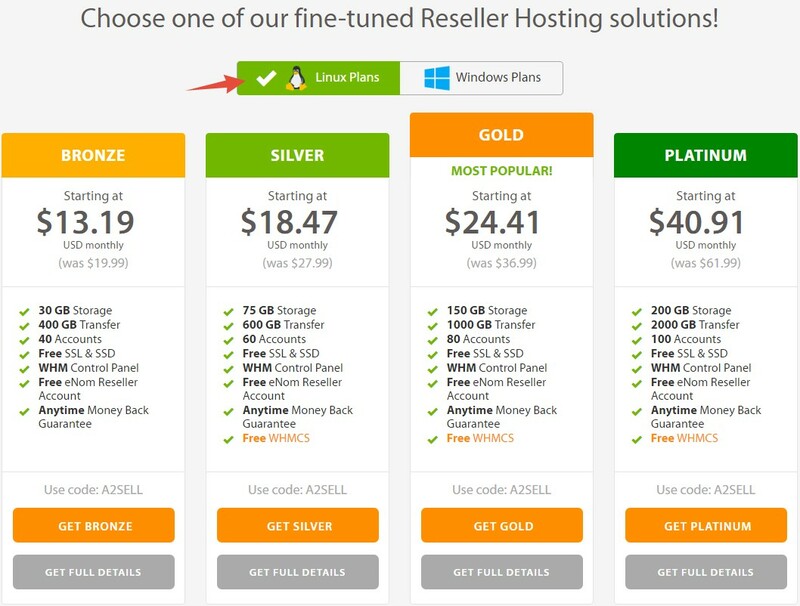 You will have free WHMCS or Blesta web host manager for free with all of the reseller plans (except the bronze plan). With the help of these, you can manage all of the accounts separately. You can get access to the back end of the cPanel of all of your customers. So, you will have the ultimate power over all of your customers. You can create your own package, suspend, unsuspend, or even delete accounts. And, you can also use those to create your billing system. With the A2 Hosting reseller plans, you will have the Softaculous auto-installer. By using this, your customers can install any popular CMS with just a few clicks. You will also be able to create unlimited email and FTP accounts. You will also get free SSH and SFTP access. There are more features and services come with these plans. In order to save our time, we won’t discuss all of them here. You can know about them from their website. At this point, we will be experimenting the page load speed of the A2 hosting provider. To do that, we will be using the popular Pingdom website. They have several test servers from where we can run this test. For this test, we will be using their test server which is located on Washington D.C, USA. So, let start the experiment. So, we have got our result, we will emphasize on the ‘Load Time’ here. You can see that the ‘Load Time’ of our test website is only 827 ms. As a matter of fact, this is a great load time. Generally, it is a good sign if your website completely loads up within 2 seconds. And luckily for us, our test website was faster than that. The load time of a website actually depends on a lot of factors. So, we bet that if your website is well optimized then you will be able to get faster load speed than our test site. If you already have a website then you know the importance of uptime for you and your business. Even if you are just starting out you should know that it is not good for you if your site goes down frequently. You should look for a web hosting provider which is known for keeping up the industry standard uptime record. For your information, the industry standard uptime record is having a 99%+ uptime throughout a year. For a normal hosting company it might be a challenge to keep up with that. But almost all the popular hosting companies always try to keep that record consistently. And A2 Hosting is not an exception. How do we know that? We have a website which is hosted on A2 hosting and we keep monitoring the uptime of that website continuously. Thus, for you, we will provide that stat next. So that you can get an idea about their performance. The uptime stat of A2 hosting is shown below. Simply put, the uptime record of our website is more than perfect. A2 Hosting kept 100% uptime for the most part. And they were always above 99% i.e. the industry standard. It is also true that on some of the months there was some downtime as well. And, it is common. But the most important thing is that they were never below the industry standard uptime record. It is a remarkable indication for the reseller hosting users. Because if the uptime record of A2 hosting would be below industry-standard then you would be in peril. Your customers would leave you and your business would face a hard time. But now, you won’t have to worry about your website’s uptime or downtime if you go with A2 Hosting. Customer support of any company is a crucial factor. If a company does not treat their customers the best way. Then they don’t deserve to have any customers at all. So before you finalize that you are going to use A2 hosting as your next web hosting provider, we would like to let you know about their customer service at first. So that you don’t get into any trouble later. And, for a reseller account, it is more important. As you will resell these accounts, so your customers will get to you for solutions if there’s any problem arise anytime. At that moment, only the customer service of A2 Hosting can save you. But, lucky for you, A2 hosting has a good reputation about their customer service among the website owners around the world. They have a plethora of tutorials and knowledge-based articles on their support page. Additionally, you will also find FAQ section, where many of the web hosting related frequent questions are already answered. Yet, if you don’t find the solution to your problems, you can contact them anytime. They are available 24/7/365. You can reach out to them using any one of the methods below. You can also apply for their ‘Priority Support’ feature. That way, your question will be answered first as you will be one of their VIP customers. It is a great feature if you are one of their reseller account owners. So that you can solve the problem of our customers as fast as possible. Even if you don’t have an account with them, you can use the ‘Pre-sale Customer support’ page to talk to them about your inquiries. We can say that you can go with A2 Hosting without any hesitation. You will be in good hands. Final Words: Should you go with A2 Hosting Reseller Web Hosting? So far, we have covered a lot of grounds here. We have talked about all the different reseller hosting plans of A2 Hosting. Then we have also explored the services and features which come along with the packages. Moreover, we have also shared some insider information like the uptime record and our personal experience contacting the customer support of A2 Hosting. Later, we have also put A2 Hosting to test. Where we have come to know that they are the real deal when it comes to page load speed. From all of these, it is clear that A2 Hosting is one of the best web hosting providers out there. With A2 Hosting Reseller web hosting service, you will have the best website uptime, performance, and reliability. So, you can choose A2 Hosting if you are thinking to get a reseller web hosting account. As you know we have used their service for one of our test websites, we can say that we were very satisfied with their service. And, we believe that you will also be pleased with their service if you go with them.